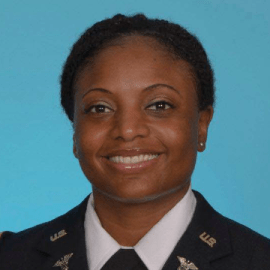 Brandi Walker, PhD, is an active duty officer in the Army’s Medical Services Corps, serving as a clinical psychology resident at Tripler Army Medical Center. She is a recent graduate of the APA-accredited clinical psychology program at Howard University where she specialized in children, adolescents, and families. She earned a master’s in rehabilitative counseling from the University of Maryland, College Park and has held licensure as a graduate-level licensed professional counselor, licensed alcohol and drug counselor, and certified rehabilitation counselor. Walker has sought out and embraced meaningful opportunities to serve clients and their families within a varieties of communities or settings to include the military, providing excellent behavioral health psychoeducation and interventions. She is an advocate for research and is currently leading a nationwide community health study on ADHD and sleep in the pediatric population. Over the years, she’s served in an array of unique capacities, including a combination of volunteer services with agencies/organizations dedicated to mentoring and coaching youth. Similarly, her unique military assignments include sensitive operations such as the Casualty and Mortuary Affairs mission. Most recently, she served as a victim advocate for the Army’s Sexual Harassment and Assault Program, and a Master Resilience Trainer.